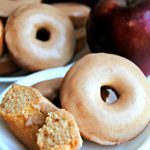 These easy baked gluten-free apple cinnamon donuts with maple cinnamon glaze will be your family’s favorite fall breakfast treat. Naturally dairy-free too. I finally broke down and ordered a full sized donut pan. I am so glad that I did! Donuts are my new favorite baked goodie to make. Baked donuts are so easy to make, I can’t believe that I did not try and make them sooner. My trick for making donuts easy is to put the batter into a large plastic storage bag, then snip the end off and use it to pipe the batter into my donut pan. My husband’s favorite treat is donuts and he misses them terribly. I was so excited when these beauties came out of the oven and I dipped them in the maple cinnamon glaze. They smelled so good and I could not wait for my family to try them. 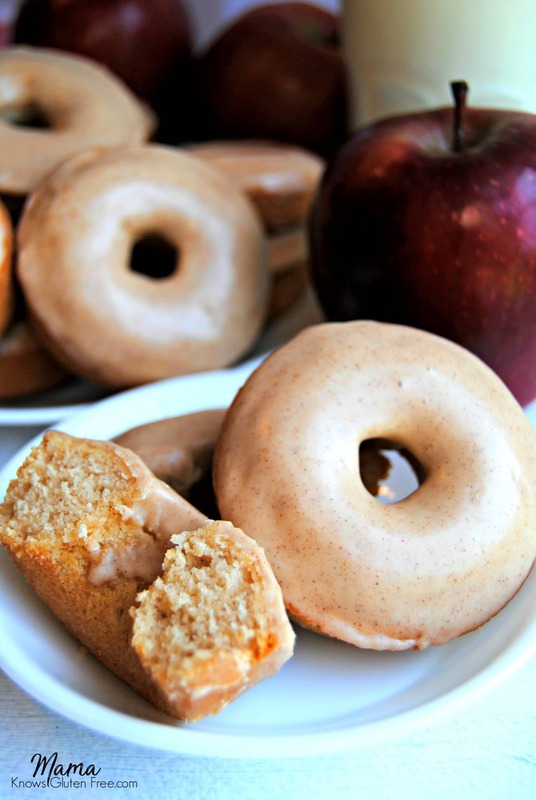 I promise these baked gluten-free apple cinnamon donuts will make you smile. Looking for other gluten-free apple recipes? Try these! These easy baked gluten-free apple cinnamon donuts with maple cinnamon glaze will be your family's favorite fall breakfast treat. Naturally dairy-free. Spray full sized donut pan with cooking spray. In a large bowl combine the sugar, eggs, applesauce, vegetable oil and pure vanilla extract. Mix until fully combined. Add gluten-free flour, xanthan gum (leave out if your flour already has it), cinnamon, salt and baking powder and mix until fully combined. Add batter to a large plastic storage bag (or piping bag). I like to take a tall cup and put the bag inside of the cup so it's easier to fill the bag with the batter. Close the seal of the bag. Cut the tip off of the bag. Squeeze the bag carefully filling the donut pan. Bake for 14-16 minutes. They will be golden brown and set. In a small bowl whisk together the ingredients for the glaze. Dip each warm donut into the glaze and place on a plate or wire rack. Oh my goodness!!! I am making these ASAP! Thanks for linking to your doughnut pan, too! I need a full size one as I’ve only got one for mini doughnuts! Thanks friend! I’m so glad that I broke down and bought a full-sized donut pan too! I only had one for mini donuts too. We are loving the big donuts. Can these donut be fried? Will I be able to work the dough in donut shape? Hi Cat! I have never tried to fry them. I have only made baked donuts. Thanks for asking! How many full sized doughnuts does this recipe make? I want to try them with the silicon doughnut molds I bought. My molds make 18 doughnuts. Hi Carol! The recipe makes 16 donuts (baker’s dozen) with my donut pan. I hope you enjoy them! Hi Lorna! You could use either regular applesauce or unsweetened applesauce. I hope you enjoy them! WOW!!! These are the best GF donuts I have ever made. My kids couldn’t stop eating them. The consistency is perfect and the glaze is out of this world! THanks for sharing this recipe!!! Hi Tiffany! I am so happy that everyone enjoyed the donuts! My whole family loves these too. You are so welcome, I love sharing what I make for my family. It really makes my heart happy to hear your kids enjoyed them. Thank you so much for the wonderful 5-star review! 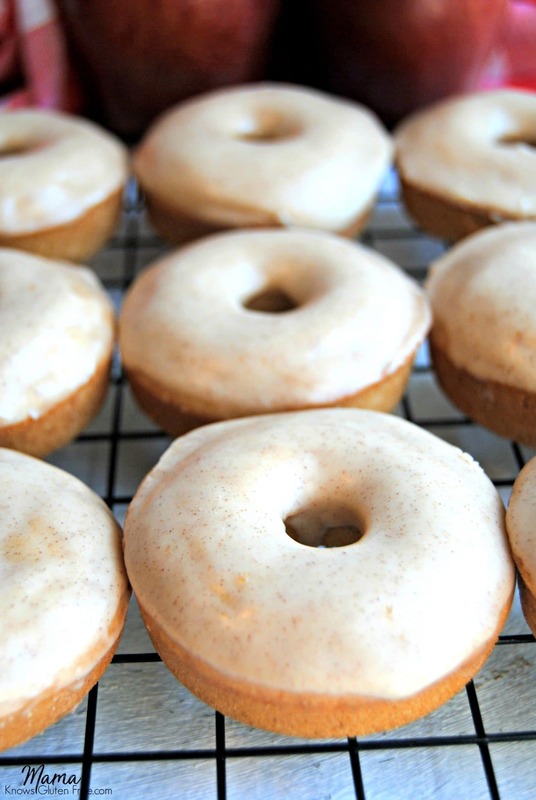 Have you tried a baked donut recipe that is egg free? I can use flax egg or chia egg. Hi Gina! I have not tried to make these donuts egg-free. If you try them can you please let me know how they turn out? Gina, have you tried making it egg free? I’m curious how it turned out. I use Ener-g egg replacer or flax eggs. Wanted to ring in the Fall with an apple donut. Found your recipe and started making them. Too bad I only had a half cup of applesauce. I subbed a can of pears, drained and pureed in the blender, added a bit of allspice, in case they needed a bit more flavor. Yummy! Great recipe! Even without icing! Thank you so much Mary for the wonderful 5-star recipe rating! I love that you used pears with the applesauce. I bet that was a lovely flavor combination. I am so happy that you enjoyed the donuts! My family loves them. I made these today but I was out of applesauce so I mashed bananas and used those instead. Still very good. One thing though, the glaze was too thick so I added some milk to it to make it thin enough to dip my donuts in. Thank you Becky for the wonderful 5-star recipe review! I am so happy to hear that the bananas worked well in the recipe and you enjoyed them. Thanks again! Thank you so much Janelle for the wonderful 5-star recipe rating review! I am so happy that you enjoyed the apple cinnamon donuts. 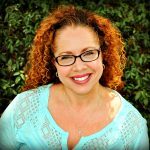 Hi Jamie thank you so much for the wonderful 5-star recipe review! Honestly, my family eats all the donuts in one morning. Gluten-free baked goods are always best when fresh. If you were to make them ahead of time I would do them the night before. Thank you for letting me know that the extra applesauce worked for egg-free. I hope everyone enjoys the donuts. Thanks again!